Despite the observations that Washington's new 10th Congressional District will be "centered on Olympia," it actually won't be. 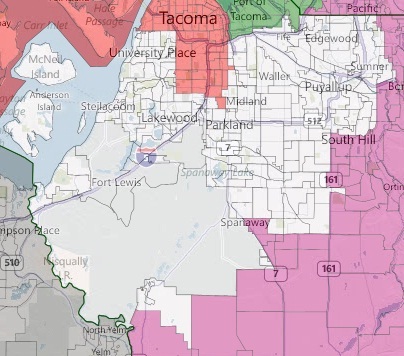 While it really does look like the district is geographically centered on Olympia. But, in terms politics and population, the district is firmly centered on the Parkland/Midway/Puyallup metro area. And, just a short note. If, in this redistricting process, if you haven't discovered Dave's Redistricting Tool, I'd suggest you check it out. Dave Bradlee has done a great service to all of us who like to tinker with this sort of stuff. So, anyway, while the map puts Olympia at the center, the south Pierce County suburbs are the defining feature of this district. Just about two-thirds (415,000+) of the people in the almost 670,000 living in the district are in Pierce County. While the district as drawn is marginally Democratic (53 percent according to Dave's tool), a lot of that is sitting in the non-Pierce County areas. Without Pierce County, the district is more safely (56 percent) Democratic. While there has been a lot of talk about how this Olympia-centered district will behave (Thurston County is heavily Democratic, did you know that?) there's not very much talk about how this suburban Pierce County boarding on JBLM district will behave. And, don't get me wrong, I am happy to be separate from the almost Oregon that was the 3rd CD, but the one we're in now is a far cry from being "centered on Olympia." We've just traded one set of noisy rural conservatives for less noisy suburban moderates. Otherwise known as neighbors. No need to create a utopian district. Thanks, Emmett. I suspected this, but was too lazy to check the population statistics. It's really a suburban district, that happens to include Olympia. ...Especially if you add Lacey to Parkland, Lakewood, etc. 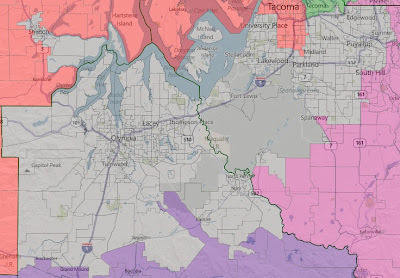 The campaigns and congress-critters from this district will focus on suburban issues, not Olympia's issues. Matthew, you are reading my mind. I'm about to put up a new post revising my statement about 10 CD being centered on Parkland. Its a JBLM district and its politics will likely center around the culture of a military town.